Throughout 2017, Dunn Solutions will keep up with Daniel Westbrook as he restores this historic Seattle residence. This video and post are part of the ongoing series. For other related posts, click here. One of the most rewarding experiences I’ve had as a carpenter is the satisfaction of implementing a design, admiring the final product, and seeing how it beautifies a space. It’s a real privilege to be the hands-on vehicle that designers and homeowners rely on to ensure their vision becomes reality. 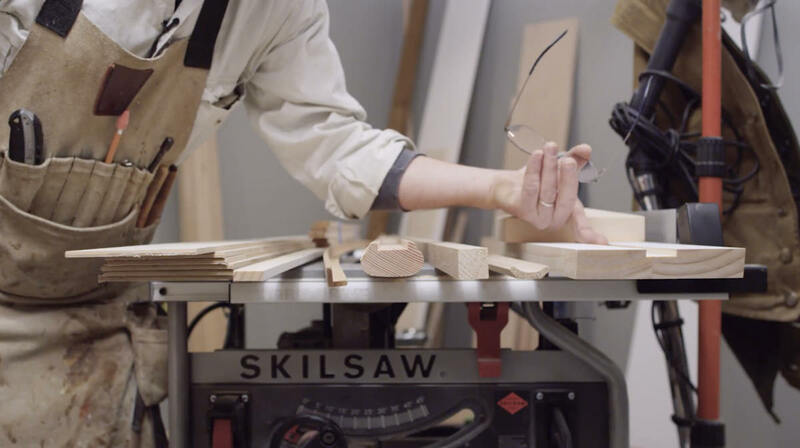 A carpenter’s knowledge is critical in understanding how off-the-shelf standard millwork can be modified to create a custom look (which matches an existing design). A common feature of many homes is a sunken living area (like a living room) that requires a stair or two leading down to the space. This "step down area" can be customized using standard millwork components to create a unique, beautiful transition. For this "step down" area, I am installing a railing, post wrap, crown moulding, newel post, post cap, and a knee wall (at the end of the steps). While there are many different ways to efficiently install standard millwork for a custom look, I’d like to walk you through the process of how I would accomplish a project of this nature. The key to these kinds of projects is some prior planning, and a sketch or illustration to determine just how everything is going to lay out and fit together. 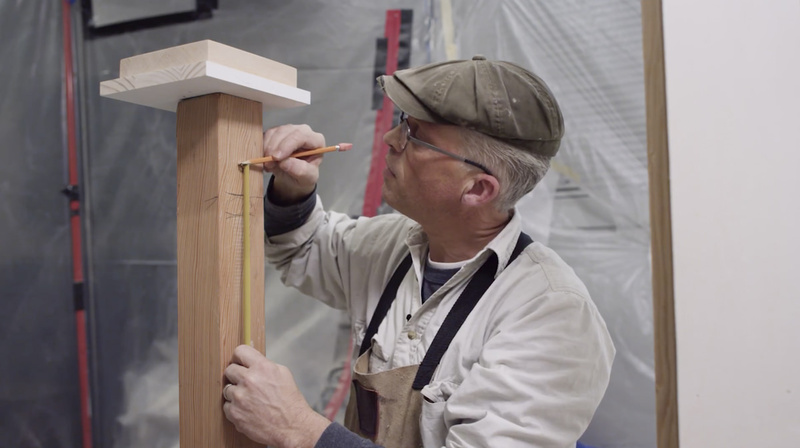 I've said many times before that the best craftsmen plan ahead by performing material take offs—taking measurements and drawing out the details of how the components will fit together within the building process. The great thing about lists and drawings is that they become a reference point—something to refer back to once work commences, or when you're at the lumberyard picking up materials. 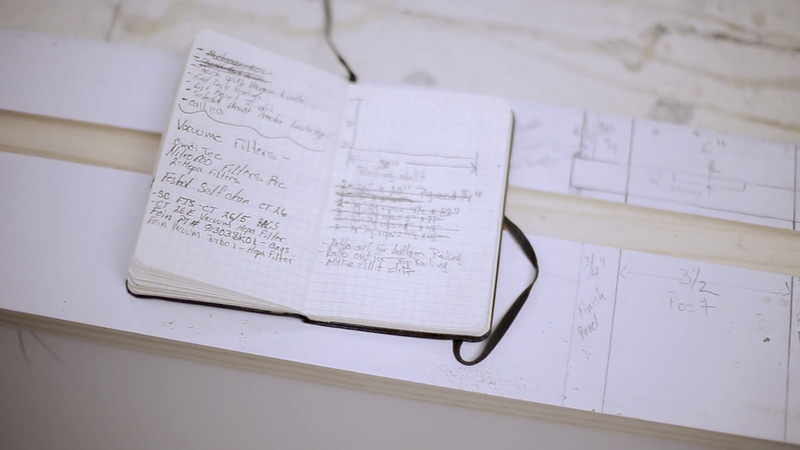 Measurements and drawings are key to working efficiently, because there's less chance of forgetting something or making a mistake. All this stock will be used in an orchestrated way to create a finished, custom look. I've seen too many railings where the balusters are just toenailed with finish nails. This creates a flimsy setup—not what I would call a quality solution. We can do much better than that. Once the stock is purchased, the drawings help identify where modifications need to be made to customize the stock. In this instance, we’ll create a custom look by combining and cutting our stock and off-the-shelf materials. As an example, I've taken the base plate and underside of the railing, and cut a dado (or plow) that fits the balusters precisely. I’ve also cut a fillet strip that can be installed between the balusters once they are put together. This makes for a strong, long-lasting joint, as well as a great, finished look. Then the rest of the stock is simply cut down to the sizes we need for their intended uses. By this point, you should have all the stock needed for installation. I like to modify all the stock in my shop before I arrive at the work site, so that it’s just a matter of measuring and cutting to length during on-site installation. Because we’re dealing with concrete, I like to use construction adhesive and screws where I can. I’ve modified the existing stairs and installed the post. Each side of the pony wall is made of a finished piece of plywood that the carpet will extend to. Next, the base plate will be installed on top of that plywood—creating a knee wall and a ¼” overhanging reveal on either side. The pieces of the base plate need to be cut and joined together seamlessly. Paint-grade materials are a great choice, and can make work more expeditious because paint, putty, and caulk hide a multitude of mistakes and blemishes. But that doesn’t mean you should be sloppy with your joinery. Tight joints glue together much better. In short, feel free to use paint-grade materials, but perform your due diligence for a quality result. The key here is figuring out where to make the cut. This depends on the railing height and how it comes down the stairs. 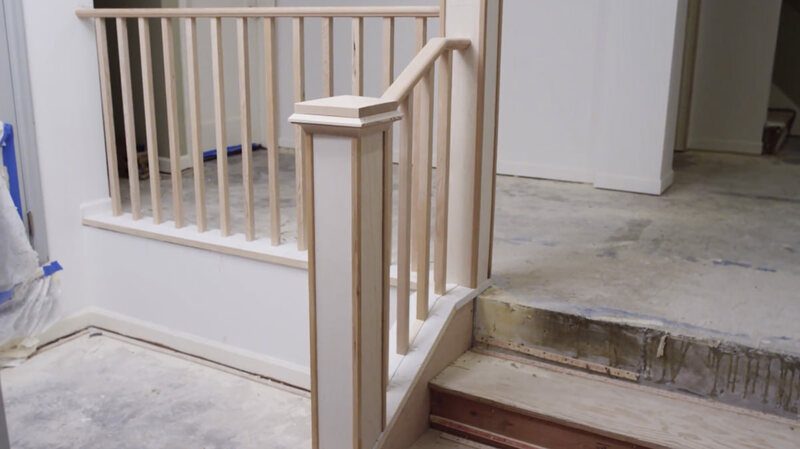 You’ve seen a lot of railings with a gooseneck that's a drop down from the top post into the sloped railing, which keeps the railing the same height from the stair nose as it continues down the slope. It all depends on where that upper post is located and the desired finish look. There's a simple solution in this case, because we are essentially doing a post-to-post railing that doesn’t have a continuous point of visual reference like what you might see on a continuous hand rail. I installed ¼” finish skins around the posts. The post I installed at the bottom of the stairs also needed furring spacers to make it the right size to match the existing full height post. Following this, I installed the post cap that I've already made in the shop, as well as the crown pieces at the top of the full height post. Next up was the installation of the corner beads to cover up the corners of the 1/4" skins that were installed. Then I make the cuts, and fit everything together using the finish nail gun. I like to cut a baluster to the right size for a spacer under the grab railing, and then secure the grab railing first at each end using a cabinet screw. Usually I like to use a railing bolt, but in this case a couple of long pocket screws (set from the bottom) should work just fine. 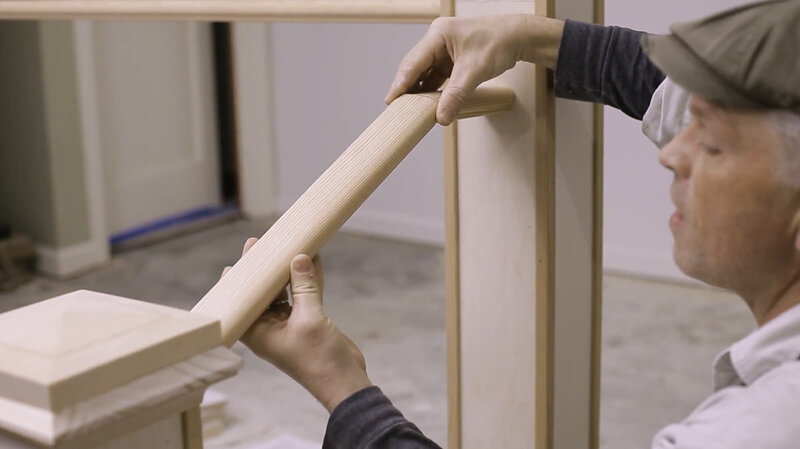 Once the railing is in place, lay out the spaces for the balusters, then cut and install them with the fillet strip to fill the spaces between each baluster. This design will separate the home's spaces while beautifying an otherwise sterile post and steps. The design also creates a railing that’s a safety barrier. With careful planning and layout executed by a good carpenter, the results will provide an effective, seamless custom millwork feature. If you have questions related to this project, please feel free to contact me at westbrookrestorations@gmail.com.